Foosball wraps and tubes are used in every tournament and by nearly every professional player. Wraps can greatly improve your ability to grip the foosball handle and can make it easier to shoot advanced shots like the pull shot or snake shot. Many players also use wraps on their other handles because they can help improve passing and defense. They also serve as a way to enhance your grip as your hands tend to sweat after playing for a while. Our recommendation would be to try out different types of wraps because they come in a variety of thicknesses and tackiness. Just remember there is no perfect wrap because it depends on how you play the game and your own unique style. Foosball wraps can range in price depending on the type and quality of wrap you want to purchase. Foosball handle wraps can be found from $1 to $3 a piece. You should purchase wraps in quantity packages because you should use wraps on all of your rods. Some foosball players even prefer to use tennis handle wraps because they are easy to find in stores instead of finding specific foosball wraps online. 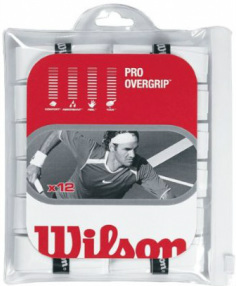 We recommend the Wilson Pro Overgrip wraps because they are made to withstand a lot of friction and are also used in tennis. You should need to replace your wraps every 2-3 months for heavy play if you want to have a good tacky wrap on your table at all times. You will know when your wraps are worn out when they feel hard to the touch and have lost their moisture and tacky feel. Start by completely unraveling your wrap. Next, start with one end of the wrap and put it on the front of the foosball handle closest to the table. Next simply hold the wrap with your right hand and use your left hand to rotate the handle. If the handle is rolling on loose or with slight gaps, unravel the wrap and redo the problem spots applying a larger angle and more tension on the wrap as you are rolling it on. Watch the foosball handle wrap video to see a full visual tutorial.